Complete fuel system kits include a state-of-the-art Edelbrock electric fuel pump offering maximum performance in a compact package. Kits also include matching fuel pressure regulator (if required), a Russell ProFilter fuel filter, a dual-feed carb kit with fittings (carb applications), a fuel pump relay and wiring assembly, 20 feet of our ProClassic or traditional ProFlex hose, plus an assortment of hose ends, adapters and mounting brackets. Available with traditional red/blue or black/silver fittings for a unique look! This kit provides a complete fuel system for GM LS-series and Chrysler Hemi engine swaps in muscle cars, street rods and off-road vehicles. 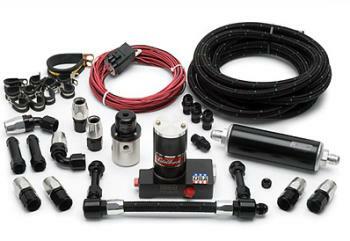 These kits include an in-line Edelbrock electric fuel pump #3594, regulator/fuel filter assembly, fuel pump relay and wiring assembly, fifteen feet of ProFlex hose, plus an assortment of hose ends, adapters and mounting hardware. When using with OEM fuel tank sending units, an additional adapter to -6 male AN is required. Russell Fuel Plumbing Kits include all of the necessary components to plumb your fuel system from the firewall to the manifold. Kits include an Edelbrock Fuel Pressure Regulator, Fuel Rail kit, and new ProClassic or traditional ProFlex hose, plus an assortment of straight, 45° and 90° hose ends, adapters and mounting brackets. Available with traditional red/blue or black/silver fittings.